I’m not a vegetarian, but I do love vegetables and am always looking for new ways to cook old favorites. 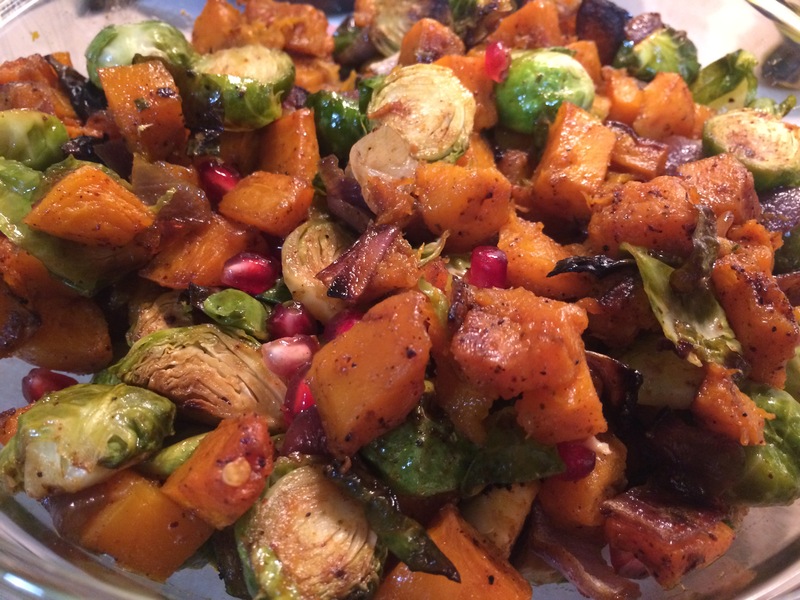 I’m a fan of roasted Brussels sprouts and roasted butternut squash, so when a friend posted this Pioneer Woman recipe for Beautiful Brussels Sprouts, I knew I had to give it a try. There were a couple of new-to-me ingredients in this dish, namely pomegranates and pomegranate molasses. I had never dealt with seeding a pomegranate before, and suffice it to say things got a little messy. I found a You Tube video that showed how to cut the thing open, loosen the seeds by working the rind, then knock out said seeds by whacking the underside of the rind with a hefty implement like a wooden spoon. Unfortunately, I worked the rind a little too vigorously–it split apart, sending seeds and juice everywhere. Let’s just say the counter—and the nearby wall—got a good cleaning. Anyway, I chopped up the veggies, and roasted away. This brings us to the pomegranate molasses. I wasn’t able to find it in stores, and didn’t have time to make any. So I used the next best option mentioned in the recipe, a syrupy balsamic vinegar that I can only find at Williams-Sonoma. Not a glaze per se, but a weighty vinegar usually used for drizzling over cheeses and fruit. It is pricey, but a little goes a very long way—I use it alone as a salad dressing, and a tablespoon is enough to flavor a fairly large salad. I do like this recipe. It’s so colorful, a welcome addition to a fall or winter table. The sweetness of the squash and pomegranate seeds counters the occasional bitterness of the sprouts, and the flavor of the roasted onions is a perfect complement. Definitely a keeper. Eggplant. It had been years since I’d cooked anything with it. 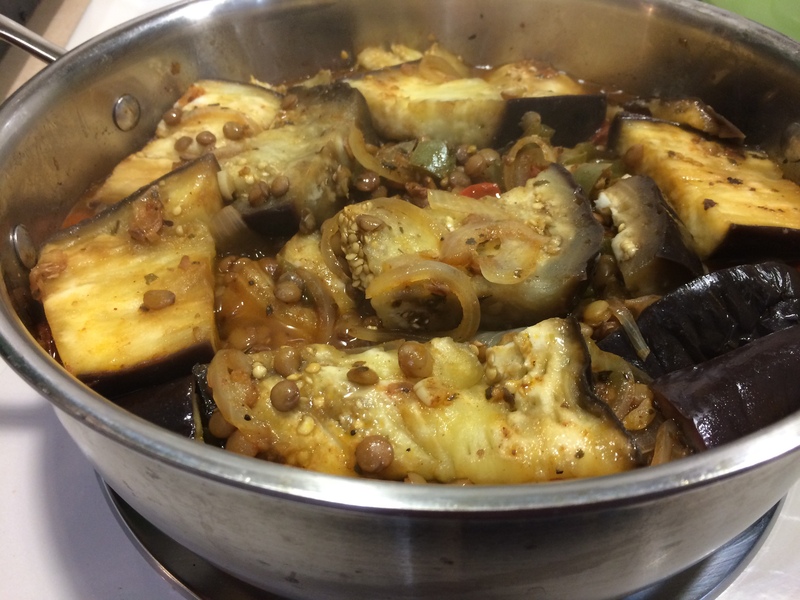 But as I poked through the internet looking for info about pomegranate molasses, I came upon this recipe from Food & Wine for Eggplant and Lentil Stew with Pomegranate Molasses. I used green lentils instead of brown because that’s what I had in the cupboard. Since I had no molasses, I decided to use the same syrupy balsamic vinegar I used for the Beautiful Brussels Sprouts. I didn’t have fresh mint leaves, and so used 2 teaspoons dried spearmint leaves. 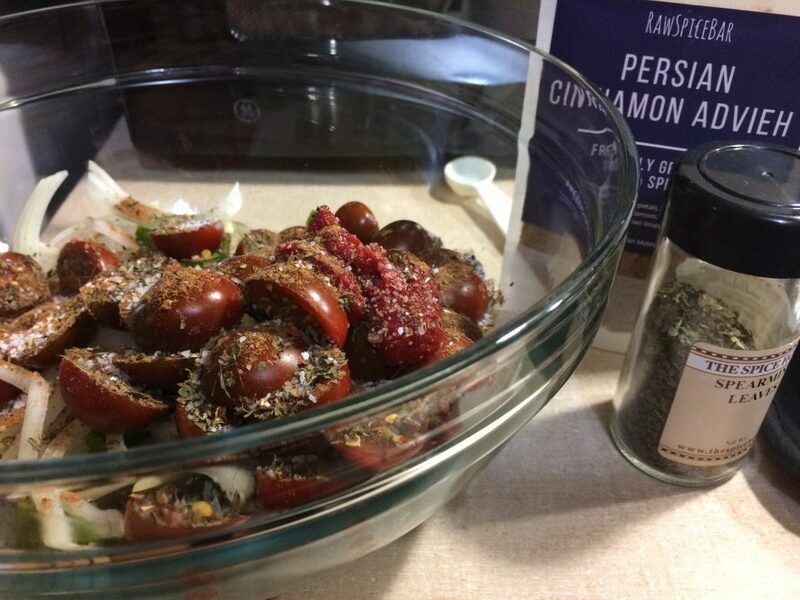 I also decided to use some Persian Cinnamon Advieh that I received as a free sample from Raw Spice Bar. I had never heard of advieh before. Blends vary depending on region, with some being sweeter than others. I decided to use this one because it contained toasted cumin and coriander, which I love. In addition, I had used it previously to flavor some couscous, and was able to detect the lime. It’s a Persian spice blend, and the stew is Turkish, so it’s not strictly by the recipe book. But the recipe as written didn’t call for any spices, and given that I can never leave well enough alone anyway, I decided to go for it and added a heaping tablespoon. After hunting through other eggplant recipes, I also decided to skip the partial peeling and salting step. One article noted that it was only necessary if one wanted eggplant as dry as possible for frying. Since I would be braising, and could let the stew cook down in case there was too much liquid, I didn’t see the point. 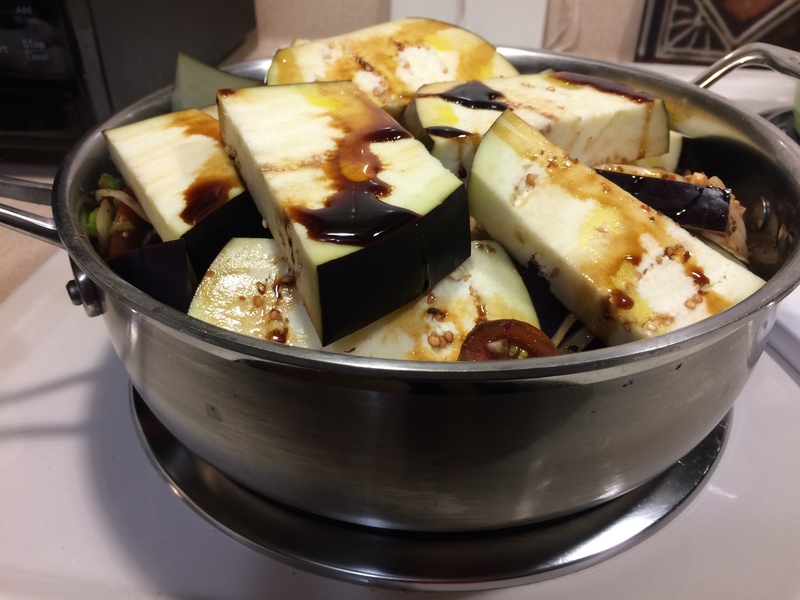 So I simply cut it up and layered the eggplant with the other vegetables in a 3-quart casserole. As you can see below, things became a little cramped. So I moved everything into a 3.5 quart skillet, which was still not quite large enough. I was, however, able to mash the cover down after a few minutes’ simmering. Over time, everything cooked down. By the end, the skillet was only half-filled. I let the stew simmer without a cover for a half-hour or so—the resulting broth was fragrant and delicious. 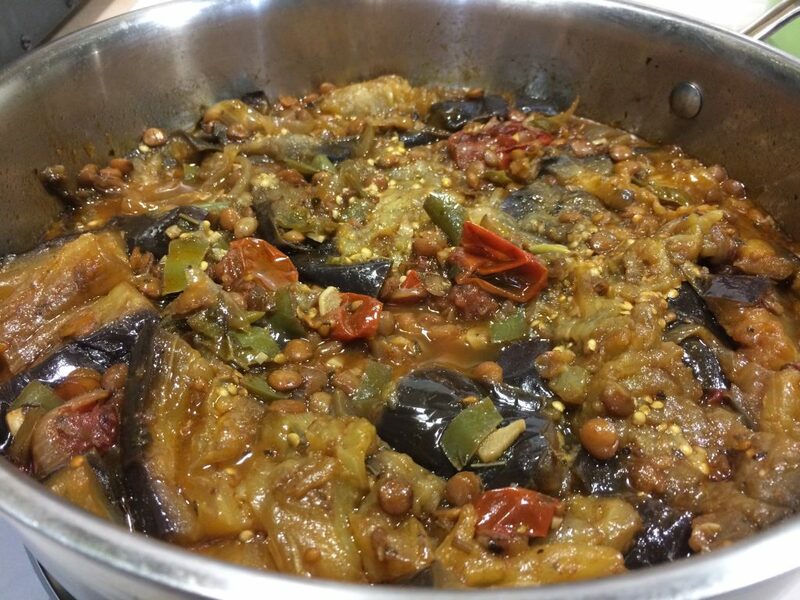 Okay, it’s not the prettiest dish in the world, but if you’re an eggplant fan, I’m pretty sure you’ll be pleased. Another keeper recipe. The advieh adds lovely cinnamon undercurrents—I am definitely going to make it a regular addition to my overflowing spice drawer. Next → Next post: Soup!